Dr. Chrissi Hart reads: The Life and Miracles of Saint Nicholas, The Wonderworker by Count Michael Tolstoy. The Publishing House of the Metropolitanate of Montenegro and the Littoral (2001). "God's Chosen One" from The Life and Miracles of Saint Nicholas, the Wonderworker by Count Michael Tolstoy - Part One. The Publishing House of the Metropolitanate of Montenegro and the Littoral (2001). "The Story of Three Girls" from The Life and Miracles of Saint Nicholas, the Wonderworker by Count Michael Tolstoy - Part 2. The Publishing House of the Metropolitanate of Montenegro and the Littoral (2001). The Life and Miracles of Saint Nicholas, the Wonderworker by Count Michael Tolstoy - Part 3. The Publishing House of the Metropolitanate of Montenegro and the Littoral (2001). The Life and Miracles of Saint Nicholas, the Wonderworker by Count Michael Tolstoy - Part 4. The Publishing House of the Metropolitanate of Montenegro and the Littoral (2001). The Life and Miracles of Saint Nicholas, the Wonderworker by Count Michael Tolstoy - Part 5. The Publishing House of the Metropolitanate of Montenegro and the Littoral (2001). The Life and Miracles of Saint Nicholas, the Wonderworker by Count Michael Tolstoy - Part 6. The Publishing House of the Metropolitanate of Montenegro and the Littoral (2001). The Life and Miracles of Saint Nicholas, the Wonderworker by Count Michael Tolstoy - Part 7. The Publishing House of the Metropolitanate of Montenegro and the Littoral (2001). The Life and Miracles of Saint Nicholas, the Wonderworker by Count Michael Tolstoy - Part 8. The Publishing House of the Metropolitanate of Montenegro and the Littoral (2001). The Life and Miracles of Saint Nicholas, the Wonderworker by Count Michael Tolstoy - Part 9. The Publishing House of the Metropolitanate of Montenegro and the Littoral (2001). 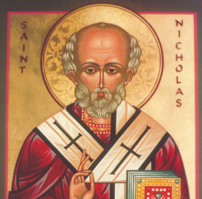 The Life and Miracles of Saint Nicholas, the Wonderworker by Count Michael Tolstoy - Part 10. The Publishing House of the Metropolitanate of Montenegro and the Littoral (2001). The Life and Miracles of Saint Nicholas, the Wonderworker by Count Michael Tolstoy - Part 11/conclusion. The Publishing House of the Metropolitanate of Montenegro and the Littoral (2001). "The Story of Three Girls" from The Life and Miracles of Saint Nicholas, the Wonderworker by Count Michael Tolstoy. The Publishing House of the Metropolitanate of Montenegro and the Littoral (2001).